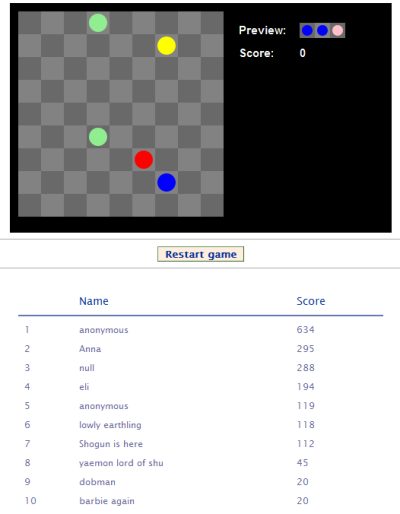 A few years ago I've released a clone of the "Colorful lines" game (called GLines on Gnome), named Perlines. It still works quite well. The HTML5 canvas element is really nice and works just like any other canvas / graphical device context in a GUI framework. It has nice performance and an intuitive API. It's also the first time I've actually done any serious AJAX. It turned out to be pretty straightforward on the client, with the generous help of jQuery. On the server side it's even simpler. I was surprised how easy it is to craft a simple DB-backed server for storing the high-scores using Django. It was probably the most effortless part of the project - Django really does make server development in Python ridiculously simple. I will play with it myself for a few more days and then release all its source code to the public domain. Naturally, the client-side code is accessible even now by viewing the source of the page in your browser.